There are many tools available for optimizing brain health and cognitive performance. Let’s discuss key dietary, lifestyle and nutritional supplement strategies for optimum neural function. Dr. Michael Ruscio, DC: Hey, everyone. Welcome to Dr. Ruscio Radio. This is Dr. Ruscio. Today I’m here with my good friend and super fit—although right now, perhaps a little bit high on glue fumes—Ben Greenfield. Ben Greenfield: I’m always high on something. Right now, it’s glue fumes. It’s hunting season up here. And you texted me while I was out in the garage making arrows. I have some screw-in inserts that you use in the carbon. And they require a decent amount of pretty good glue. So, yeah, I’ve been out huffing glue and playing with sharp things. DrMR: And the deep irony is that the topic today is ways to improve cognitive function so this is a real test of that. Mitochondrial health is important for brain function and requires clear air, clean food and clean water. Nootropics help improve brain function and cognition. Get help with cognitive function. DrMR: Well, I’ve been wanting to dig into this topic for a while. And obviously, there’s a bunch of different ways that we can go. I want to pose an initial concept to you and see what you think about this because when I think about cognition—and certainly I don’t consider myself a cognition expert—but it seems that there may be two fundamental ways that we can improve cognition. One through optimizing or improving circulation, and the other through stimulation. And maybe there are other items. But do you think we can organize two of the main approaches, like caffeine compared to gingko, stimulation compared to circulation? Do you see that that’s a viable way to try to partition some of these available therapeutics? BG: Yes, although I think there are other things that should be taken into consideration. For example, if you are increasing throughput via some kind of a nootropic or smart drug, but exhausting choline levels, which is an essential micronutrient for, not only brain development but cognitive function, then you might experience a post-use crash if you’re using a nootropic or a smart drug. We know that amino acids act as neurotransmitter precursors, as do—you know this of course, quite intimately—the gut flora. And so if either of those is dysregulated or present in low amounts, then sometimes that can affect cognitive function, as well. And that might not have much to do with circulation to the brain or inflammation or something like that. There’s just not enough compounds to go around. You could say the same thing for vitamins. We know the vitamin B complex is incredibly important for brain developmental process and also to stave off some of the damage that can occur neuronally, particularly in mitochondria when you increased neural function or neural activity. Then there are things like minerals. For example, you’ll see a lot of smart drugs and nootropic compounds now, including minerals like lithium or a form of magnesium called magnesium threonate, which is very bioavailable to neural tissue or other forms of minerals. And then, of course, antioxidants and anti-inflammatories, any time you’re using anything to improve cognitive function, from caffeine to nicotine to a racetam or perhaps one could even argue some of these microdoses of psychedelics, like LSD or Psilocybin, anti-inflammatories or antioxidants, just from a pure neuroprotective standpoint are really important. Primarily I like to look at whether or not something is able to quell some of the free radical formation in the electron transport chain of the mitochondria for neural function, something like PQQ or CoQ10, for example, or quercetin, but also some of the things that are more general neuro anti-inflammatories like, say, curcumin or DHA or green tea polyphenols. So I think you have to paint with a little bit more broad brush if you’re trying to put together a decent either supplement or food stack for the brain when it comes to covering all your bases. And that’s actually one of my pet peeves is when I see someone taking makuna pruriens or L-dopa precursors like crazy to amplify dopamine levels or taking LSD or Psilocybin microdoses every three days based off some psychedelic dosing schedule they’ve discovered, and not taking into account not only the fact that a lot of times you’re flooding the synaptic cleft with serotonin and dopamine and a lot of these other neurotransmitters, but you’re also potentially producing neural inflammation or depletion of minerals or depletion of choline or either a depletion or imbalance of many of these compounds that leave you worse for the wear once whatever you’re using to enhance cognitive function has, for lack of a better term, worn off. DrMR: Right, and those are great points because one of the things that I’m assuming anyone who’s tinkered with cognitive-optimizing supplements, they may have experienced a crash. And I think many have, like you said, they’ve pushed with one item, piracetam or caffeine. Or even something like fasting, people, if they do too much fasting, they can great during. And then they crash. And so looking at this through the lens of maybe some stacks in terms of you can take x, but make sure you take y and z along with it, definitely want to deeply dig into that in a moment. But just to gloss over some of the basics for people, make sure you’re getting enough sleep. Make sure that you’re exercising. Fasting is also something to consider. Both exercise and fasting can enhance both circulation to the brain and this brain-derived neurotrophic factor, and also mitochondrial function. Carb intake—and, Ben, I’m really curious to get your thoughts on this one—carb intake in my estimation is very individual. Some people really tend to cognitively thrive on more of a low-carb or even a ketogenic type of approach. And then other people, they will just have this incessant fatigue and brain fog because they’re not getting enough carbs for the metabolism. So what are your thoughts on carbs? Do you find that same kind of personalized need to dial in the carb intake for optimal neural output? BG: Well, sure. Two things there. The first is just rewinding or backpedaling just a touch to what you were recommending from a lifestyle recommendation standpoint, which is sound advice: sleep, exercise, attention to one’s personal environment. But I would encourage folks—and I always say this before anyone turns to a smart drug or a nootropic stack or any of these exogenous compounds—to indeed take an even deeper dive into some of those things that you mentioned. For example, the air in the home. We know that mold and fungi and airborne pollutants and volatile organic compounds and off-gassing, all of these can drastically affect cognitive function during the day, whether at your home or your office. And they should not be discounted, the quality of the air that you breathe and the insulation. In my own home, I have a centrally-installed HEPA air filter that also blasts the air with UV radiation. I have a few standalone HEPA units in our daylight basement simply because I know it being a daylight basement, it’s a little bit more prone to moisture and the potential for buildup of something like mold. There’s also carpet downstairs. So I have HEPA air filters downstairs. And we have lots of plants in the home, as well, which act as natural bioremediates for the air. So you want to pay attention to that. We know that flicker from modern LED and artificial lighting can affect cognitive function. In addition to that, many of these cans, especially the ones that run on A/C currents, they generate a lot of dirty electricity. You certainly see more and more data now coming out about the link between EMF exposure and neural function. So attention paid to the type of lighting that you use in your home, one of my top recommendations is just to get old school style clear incandescent bulbs in most of the rooms of the house. And then something like a near-infrared lightbulb, the same as you would use in a freakin’ reptile cage in the bedroom or in the areas of the house where you’d want to sleep where you’d want a little bit more red light and absence of blue light. When it comes to light, there’s even a lot of data now about activation of some of the c oxidase in mitochondria via the use of infrared using photobiomodulation, using things like infrared sauna, which, by the way, is also fantastic for BDNF, which you alluded to, that brain-derived neurotrophic factor, the same thing that gets activated through fasting and through aerobic exercise. So paying attention to the absence of bad light and the presence of good light. Sunlight is, of course, the most natural way to get plenty of near and far infrared light in a full spectrum. But the use of some of these devices, there’s one called a Vielight. I was just showing this morning to one of my friends who has some post-TBI issues. And this is just photobiomodulation for the head. Other lifestyle factors in addition to air and light that you’d want to consider would be, as I just touched on, your exposure to Wi-fi routers, Bluetooth, dirty electricity. Whether or not you’d like to admit that there’s much research behind those, even just anecdotally. I’ve seen so many people have better function, especially in the afternoon as you get towards the end of the workday by doing simple things like plugging in an ethernet cable from your laptop into the router rather than using the Wi-fi signal, keeping the phone in airplane mode if you’re not using it, installing one of these glare-blocking type of devices on the screens that you’re operating on during the day. I like this one called Iris Tech, which reduces not only the blue light like F.lux does, which is a popular one. But also there’s Flicker and Glare and some of the other parameters that can affect neural function. Then finally before I get to your carbohydrate question, there’s this concept that you briefly alluded to of exercise and fasting, two very potent ways to increase what in layperson’s terms is MiracleGro for the brain. BDNF that’s elevated through intermittent fasting. It’s also elevated via, like I mentioned earlier, infrared sauna. And it’s also elevated via primarily aerobic or endurance exercise. So those are other things that you should include from a lifestyle standpoint before you start to, let’s say, fill your cupboard with a bunch of these spendy nootropics and smart drugs. Now, as far as carbohydrate is concerned, I can’t say I’ve seen a lot of data on carbohydrates and neural function. Although I can say that just from a pure metabolic health standpoint when we look at insulin, diabetic type II risk, your HOMA-IR scores, your blood glucose values, hemoglobin A1C, there is a drastic difference in the way that certain people respond to carbohydrate intake. That’s based on everything from genetic factors like salivary amylase production and pancreatic beta insulin output to digestive function, such as whether or not—and I know this is something that you’re well aware of, Michael—is whether or not someone is prone to fermentation or has some kind of overgrowth, for which carbohydrates can affect the gut-brain connection just based off fermentation and bloating and all these other things that tend to distract one from being able to cognitively function or even can influence things like neurotransmitter formation based on bacteria in the gut and that gut-brain axis. Then, of course, there are people who need to adjust their carbohydrate intake just based purely on activity levels. Like a hard-charging athlete can often stay in, let’s say, ketosis, which is a pretty good neural hack, just fine on 100 to 200 grams of carbohydrates every day. Whereas the person who’s turning to ketosis or carbohydrate restriction for medical reasons and who’s not an exercise enthusiast may need to eat 30 to 40 grams per day. So it widely varies based on your genetic potential, particularly regarding insulin and amylase, regarding your gut health, especially presence or absence of certain things that will tend to ferment, whether it’s SIBO or yeast or candida or fungus or whatever. And also your activity levels. So there’s a lot to be taken into consideration when it comes to carbohydrates. That’s just a whole different can of worms. We could probably spend hours talking about it. But, yeah, you do need to customize your carb intake based on some of those factors. And, Ben, what was the name of that light app again, the one besides F.lux? I’d like to try a new one. BG: Yeah, I think he’s a Romanian programmer named Daniel Georgiev. And he has some really good software he’s designed called Iris. I’ve interviewed him on my podcast. And it’s an interesting show because we not only discuss the type of software you can install but also monitor choice. And so what I use now is a monitor. The one I have now is made by a company called Eizo. It’s a FlexScan. And I can switch it to paper mode, just like paper mode on a Kindle. So if I’ve got a whole bunch of stuff to read and I don’t want to burn my eyeballs out, especially because I like to read research articles, certain things that just don’t arrive in paper to my house. I switch the screen to paper mode for my more intensive reading, which I often do in the evening before dinner. I’ll slip down into the office. And I don’t have any lights on in the office. Just that one monitor is on. And I still wear blue light blocking glasses and whatnot. But, yeah, the software is called Iris Tech. And the monitor I use right now is the FlexScan monitor made by Eizo. DrMR: Yeah, I didn’t realize there was a monitor like that. That would actually be fantastic because one of the things that I get so sick of is just being in front of a computer screen. I feel like my life is lived in front of a computer screen. 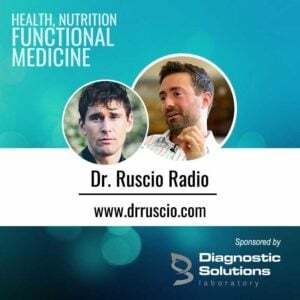 DrMR: Let’s talk about one of my favorite tests for digestive health, the GI-MAP from Diagnostic Solutions, who has helped to make this podcast possible. Now if you’ve been reading any of the case studies that I’ve published in the Future of Functional Medicine Review clinical newsletter, you’ve likely seen that this test, the GI-MAP, is a test I frequently use in my practice. They also have some valuable and helpful clinical markers like calprotectin which can help rule in or out irritable bowel disease, and zonulin, a marker of leaky gut. So head over to DiagnosticSolutionsLab.com to learn more and to order your test. BG: Yeah, clean air, clean food, clean water, all of those can influence the electron transport chain. And what you wouldn’t want to do—and you’ll see a lot of folks doing this—is simply consume anti-inflammatories willy-nilly, or antioxidants willy-nilly, thinking that they’re actually going to be beneficial for the mitochondria, when, in fact, you do need to be careful. We know high doses of synthetic antioxidants like vitamin C and vitamin E might not be as good as other antioxidants that have been shown to be able to quell excess free radical buildup in tissue without necessarily interfering with the necessity of free radical signaling in the mitochondria because free radicals, that’s one of the primary ways, in addition to neurotransmitter and hormones, in addition to just basic nerve signaling—electric transmission—and in addition to, if we really want to take a little bit more of a geeked out dive into biophotonic energy, cells actually can use light to communicate. Well, one of the other ways that cells can communicate is via free radicals. The presence or absence of free radicals is how the mitochondria know to increase or decrease activity in the electron transport chain. And so if we just completely blunt free radical formation all the time, then you actually can see dysregulation in terms of everything from mitochondrial energy production to mitochondrial density to natural apoptosis versus the absence of that. And so when you look at the topic at hand, neural function, I briefly alluded to, for example, PQQ or coenzyme Q10. Both of those have been shown to have profound improvements in the health of the mitochondria and in neural function, without actually limiting free radical signaling. So those would be two that I would consider to be good things to include with any type of…. There are obviously things like Alpha BRAIN and Qualia and all these different nootropic stacks out there. Well, I think that if they don’t have these type of antioxidants like PQQ and CoQ10 built in that you should add things like those. Another one that’s very important for the mitochondria based on the fact that especially in people who think a lot and people who exercise a lot, or people like me who both exercise and think a lot, you see ATP reduction and ATP depletion as being a pretty big issue when it comes to mitochondria specifically. And you can supplement with a type of low-glycemic sugar—speaking of carbohydrate—that can actually increase bioavailable pools of ATP in a similar way that creatine, which is also a nootropic, increases levels of phosphagen without necessarily having to eat a whole bunch of necessary calories. And that’s d-ribose. Daily supplementation with d-ribose is another really good one, especially for active people who want enhanced neural function. And a d-ribose creatine stack, like throwing that into the smoothie in the morning, a lot of people will see a big pick-me-up from that, regardless of what type of nootropic or smart drug stack that they’re using. And then just a few others that I briefly mention that should just be part of anyone’s diet, in my opinion, anyways, would be some form of DHA, whether that’s algael or fish-based. Some type of green tea polyphenol. Green tea just has a whole bunch of benefits—especially for people who consume caffeine—due to its L-theanine content, which can limit some of the sleep disrupting properties of caffeine. DrMR: Sorry, just drinking green tea, would that be enough? Or would you say you need some sort of supplement? BG: Really for the whole better living through science supplementation effect, you want to get close to like 500 milligrams of EGCG. And that’s a lot of green tea. So if you can get it in a supplement form, all the better. But if you want to go more natural and just drink green tea during the day, that’s another option. DrMR: What’s a good supplement there that you like for people? BG: There’s a few different green powders that you can use that have pretty high amounts of EGCG. One that I’ve been using recently, Dr. Jason Fung, who wrote that Complete Guide to Fasting book, he worked with a company. I forget their name. If you Google “Jason Fung green tea,” you’d probably find it. But they’re these little green tea packets that they’re advertising as fasting tea because it seems to do a pretty good job of quelling the appetite. But I’ve literally just been taking a couple packets of those on occasion throughout the day, just dumping them in my mouth, not even bothering to mix with hot water or cold water or anything and just taking the lazy man’s route and mainlining it into my membranes. But, yeah, green tea. And then another one, it’s more of a one-two stack that has some really potent neural anti-inflammatory effect without necessarily deleteriously affecting free radical production would be something that’s kind of a classic combo nowadays in the supplement industry. And that’s curcumin blended with some form of black pepper, like bioperine. And you’ll actually find that in some nootropic blends these days. And you can, of course, go old school, just like you can drink your green tea. You can make your smoothie and drop some turmeric root and some black pepper, black pepper pods in there. Or you can buy yourself a curcumin supplement and a bioperine supplement or a good form of curcumin that’s blended with bioperine or black pepper extract. And everything that I’ve just named has really good research behind it, particularly regarding the neural anti-inflammatory potential. So those would be compounds you’d want to include on a regular basis to address neural inflammation, again, regardless of what type of smart drug or nootropic that you’re using. DrMR: Now, Kaiser felt that CoQ10, N-acetylcysteine, alpha lipoic acid, and acetyl L-carnitine were the most important nutrients for mitochondria health. Do you have any quarrel with those for any reason? BG: No. The N-acetylcysteine and the…What was the second one you said? BG: Alpha lipoic acid, yeah, ALA and NAC. Both of those do have good research behind them. The mechanism of action isn’t necessarily anti-inflammation for N-acetylcysteine and alpha lipoic acid. Neither is it for L-carnitine. Most of those are going to act by upregulating the shuttling of free fatty acids into the Krebs cycle, for example, or amplifying mitochondrial energy output. That other one that you mentioned, the CoQ10, that can act as a mitochondrial antioxidant or anti-inflammatory. So it kind of falls under the category of what I was just talking about. But, yeah, I would say that there are a few others I would definitely include in that stack. PQQ would be one. That D-ribose I mentioned, especially if you’re an active person. I would say that would be another must. And then as I alluded to a little bit ago, I think a B vitamin complex is pretty important, as well. That would cover a lot of your bases from a mitochondrial standpoint. And I should mention a really good, somewhat recent book that I think everyone should read if they want to better understand mitochondria and especially this idea of free radical signaling that I talked about is Lee Know’s Mitochondria and the Future of Medicine. That’s a great book for learning a little bit more about how some of these compounds interact with mitochondria. DrMR: Gotcha, Lee Know. And has he been on your podcast, also? BG: No. I probably will interview him at some point. Much to the chagrin of my wife, my office is increasingly stacked with books. I’m always putting people I need to interview that I haven’t gotten around to interviewing yet. So, yeah, I need to build a little outhouse for my books or something. DrMR: Yeah, I know the feeling. So these are all supplements that I think are highly advisable in the sense that they seem to have reparative anti-inflammatory benefits. And I think these are good, solid nutritional type supports. When someone’s confronted with some of these other options that might be more stimulants, I am curious what you think about things like these smart drugs. And if you could comment also before we touch that briefly on things like gingko, are there any other of these popular supplements for cognition that you think are worthwhile? I know there’s some research gingko. I believe it’s predominantly performed in the aging populations. The problem with the mechanism appears to be—or I believe anyway—through enhancing circulation. So what else? BG: Yeah, gingko’s an interesting one. It’s actually taken from a tree. And that would fall under the category of more of a Chinese supplement. A lot of these nootropics come from either Chinese medicine or traditional Ayurvedic medicine. So gingko has a whole bunch of different flavonoids in it. And there are some pretty good rodent models that show that those can improve anti-oxidant activity. And there are human models that show that it can increase cognitive performance. So gingko would fall under the category of a nootropic. A lot of times these herbs, these natural non-synthetic, non-laboratory created compounds, they fall into the category of nootropics. And many of them work. Some of them, like yerba mate, for example, that works for a lot of people. For me, it gives me jitters. So sometimes you have to use yourself as an N=1. But I would say that some of the more well-researched nootropics that would not be considered a synthetic smart drug that I think ultimately for reasons I’ll hopefully get to in just a moment would be safer than a smart drug. One would be bacopa. Bacopa would fall into more of that Ayurvedic type of category. That one has some really good research behind it, especially from memory. Gingko is another good one, similar to bacopa, particularly for memory, but it also works well for overall executive function, lucid dreaming, a whole bunch of different effects. It’s also known as the intellect tree. I recently wrote an article on it over on my website. It’s called Celastrus. And that one is also a nootropic. That one I like. And that’s something also that I have around. Yerba mate, I mentioned. And caffeine, of course, most everyone is aware of. So I don’t need to kick the coffee or the green tea horse to death. And then one other that I’d mention as far as just more of a natural nootropic would be maca. Maca root actually has some good research behind it in terms of its cognitive and memory enhancing effects. And it’s also great for sexual function, as well. So those would be a few of the more natural nootropics. And technically, some of these racetams, they also fall into the nootropic category because they act very similar to a nootropic, like a piracetam or an aniracetam. And some of those seem to be a little bit more safe, even though they can be synthetically derived than some of these other smart drugs that act a little bit more harshly on the central nervous system. And I’ll fill you in on a few of those in a second. But I would be remiss not to name one other that’s kind of like a darling of mine when it comes to cognitive performance. And that would just be nicotine. Nine times out of ten, if you see me and I’m just smoking along through an article or trying to get through a whole bunch of books or something, for me I’ve just got a cup of black coffee and a nicotine toothpick, that’s my very simple go-to. And I think part of it is just because I kind of feel like an old school-y writer who’s drinking a cup of coffee and smoking a cigarette without all the carcinogens of the cigarette. It’s this cool like comfort foodie for me. Like if you find me down in my office working during the morning, it’s a cup of black coffee and a little nicotine toothpick. And it’s cheap compared to all these expensive nootropic herbs and everything. And it just works for me. So nicotine and caffeine is actually a pretty good stack. And some of those other nootropics that I mentioned are great to have around in the pantry or the cupboard to kind of see how you respond to them. And they’re relatively safe, most of those that I mentioned like gingko or Celastrus or bacopa. But when you look at some of these others that you talked about, technically most of them fall into the class of ampakines. Some of them are also known as monoamine oxidase inhibitors or MAO inhibitors like Depranil would be an example. Depranil’s a very popular one that is efficacious but I think relatively harsh on the central nervous system like many of these others. Some of the more popular ones would be methylphenidate or Ritalin, commonly prescribed for ADD or ADHD. Most of these, the reason I don’t like them is they intensively flood the synaptic cleft with dopamine or norepinephrine or in some cases with serotonin. And, again, you’re causing premature exhaustion of neurotransmitters, or you’re developing an insensitivity or a need for a higher and higher amount of dopamine receptors or other receptors. And it’s just one of those quick fixes that I think is a biological shortcut that creates long-term issues. Modafinil would also fall into the category of being an ampakine. And that one also, in my opinion, again, very similar to even like LSD and Psilocybin, long-term extended use, especially in higher doses, can lead to some pretty significant dopamine imbalances or dopamine resistance or lowered sensitivity to dopamine. And you’ll find a lot of people overuse a lot of these things. It’s like they don’t feel that great or that happy unless they’re on them. And that’s related to those dopamine issues. Amphetamines like Adderall, that would also fall into that psychostimulant category. That one, it’s a little bit more norepinephrine and serotonin-related. And interestingly, many of these are used or derivatives of them are used as Alzheimer’s drugs because they can block the uptake of glutamate. And that can minimize the effects of conditions like Alzheimer’s. But any time you’re completely blocking the effect of any excitatory neurotransmitter, you can create some amount of dependency or need for more receptors, or, again, a need for higher and higher amounts of dopamine and serotonin or norepinephrine to actually feel good. So these are playing with fire. I have in my pantry Modafinil. And I use it about once a month. Typically when I’m in a very sleep-deprived state, either something has happened, like sh*t has hit the fan so now I’ve got to stay up until 4:00 a.m. fixing something that’s wrong with a website or an order mechanism or somebody dropped the ball on an article and I’ve got to churn out an article between midnight and 5:00 a.m. And then I have to function the entire next day. Or occasionally I’ll fly internationally to speak at an event. And I’ll literally just fly, hit the ground running. I’ve got to squeeze in a workout, go speak, and completely just give the middle finger to sleep. But I will not claim that those are helpful at all. Yeah, Modafinil is a freaking narcolepsy drug. It’ll keep you awake through just about anything you need to stay awake for. And, in addition to that, it will allow you to punish through some pretty cognitively demanding work during that time. But it’s just like the fairy tale. I forget the name of the fairy tale where the person has the ability to pull this little string and press the fast-forward button on life whenever things get uncomfortable or they need to just find the escape. And before they know it, they’re old and decrepit. And they haven’t had a chance to live life. And they’ve pulled that biological shortcut too much. So my approach is a little bit of caffeine, a little bit of nicotine. Some of these natural nootropic supplements, when I have more cognitively demanding days, like right now I use one called Qualia. Qualia Mind is the one that I like that I feel pretty good on. It still allows me to, if I take it at, say, 6:30 am when I get up, I can still have my nice little afternoon nap that I love, sometime around 2:30 or 3:00 or whatever. And very occasional use of these more big gun type of nootropics or smart drugs, really, like that Modafinil I talked about. But we’re talking like once a month. Occasional use of psychostimulants that would be considered psychedelics, this would mean maybe once a month. Again, that little of use now. Before like a really cool, fun hike, I’ll take a microdose Psilocybin. And I’m not writing fiction right now. But I did a lot more when I wrote fiction because it does a good job merging left and right hemispheres of the brain so you can organize all your characters and lands and stories and all the parts of fiction that require the left brain but then also delve into more of the right brain creative thinking. DrMR: Does THC have any kind of similar effect in that vein? Do you know? BG: Well, for what I was just talking about, I use LSD, microdoses of LSD. DrMR: Or cannabis, for the audience. BG: The endocannabinoid system, when used as a smart drug or a nootropic, I haven’t found to be that efficacious. Like THC will induce creativity, sure. But it’s not that productive creativity. THC is like good for a concert, or maybe strumming away on a musical instrument, that type of thing. But when we’re talking about actually being an enormously productive member of society, something like a microdose of LSD would beat THC hands down, even when it comes to the creativity aspects. CBD, that would be more of like a stress decreaser that you could argue would indirectly improve your focus or cognition if you just were less stressed. But I haven’t found CBD even when sold as a part of these different nootropic compounds, which it’s now included in and combined with caffeine in things, I find CBD just induces kind of like the L-theanine in green tea really, a little bit of a mild relaxing effect, which may have some indirect cognitive-enhancing effects. But, yeah, ultimately for me it’s very occasional uses of a microdose of a psychedelic substance in small amounts, very occasional use of a smart drug that would be considered like an ampakine or central nervous system stimulant, and then caffeine and nicotine pretty frequently these days. And then that Qualia Mind stuff three or four days of the week max. And then just as coming full circle, close attention to my personal environment: air, light, water, electricity, movement, good food. That’s my strategy, man. DrMR: And with some of the brain-boosting nutrition like the CoQ10 and PQQ, are you using those more of a long-term foundational supplement that you’re not pulsing? BG: Yes. I’m so impressed with the data I’ve seen on those for mitochondrial health that I use them pretty frequently. And right now, I’m kind of agnostic on brands. I believe what I have right now is the Alms Bio glutathione, which is a liposomal glutathione taken sublingually that has several different mitochondrial antioxidants or mitochondrial support in it. In addition to glutathione, I like anything like that that’s like a shotgun supplement that takes care of a few things all at once for me. And then there’s another one made by QuickSilver Scientific and Dr. Chris Shade over there. I think it’s just called THE ONE. And it’s got a whole bunch of pretty good little mitochondrial support compounds in it, as well. So those are a couple ways that I’m mainlining some of the PQQ and the CoQ10 into my system. And then for d-ribose, I help companies sometimes develop supplements. And I’m currently helping a supplement company develop a sleep supplement that actually has d-ribose and creatine in it, kind of for athletes. And then there’s a whole bunch of other nighttime recovery and sleep compounds in there. But right now, that’s how I’m getting d-ribose and creatine is just drinking the God awful batches of powder they’re sending to me as we get the flavor profile dialed in. Yeah, so a lot of times just for me, being in the supplement industry or being a nutritionist and having all these relationships in the industry, a lot of times I just have so many brands hanging around the house. Again, I’m kind of brand agnostic. Obviously, I own my own supplement company at Kion. But we don’t necessarily have right now some kind of mitochondrial support formula. So I use other brands for that. DrMR: Yeah. I like to tell people that as long as you’re using a company that I think, looking for a company that follows good manufacturing practices or GMP and is just a credible, well-known company…I don’t get overly wrapped up in the, “Well, this is the newest, best form of this vitamin. And we’ve got it.” Sometimes that is true, yes. But usually, you’re seeing the best offerings fairly standard across some of the top tier supplement companies. And I caution people, “Don’t get overly wrapped up.” There’s always a bell and whistle that one company is trying to use to distinguish itself over another, which is fine. But just don’t let it stress you out and make you think that there’s only one form of ribose. BG: I agree. And admittedly, I’ve got to go pretty soon. But I would say that my approach is I look like you do for CGMP. If it is NSF certified for sport or TGE certified for sport, for me still competing as a pro athlete and still getting urine tested and all that jazz, that’s important to me just for peace of mind. And then the last thing I really look for—because I look at the research and make sure the delivery mechanism isn’t a waste of my time—but ultimately I look for things that are a shotgun formula that can just kill a lot of birds with one stone. I like the Thorne multivitamin or that glutathione supplement that I mentioned. Or the Qualia Mind is a nootropic that has the minerals and the anti-inflammatories, and then the racetams and stuff in it. Or my own company has one called Kion Flex, which is just everything that you’d ever want for joint support in one formula. I try to choose things that kill as many birds with one stone as possible just because, let’s face it, a lot of these encapsulated delivery mechanisms, they still have magnesium stearate and encapsular coatings. The fewer capsules I can pop on any given day, the better. So I just like to look for stuff that covers as many bases as possible. So in addition to quality and in addition to it being something I can with good conscious take as an athlete, I just look for stuff that gives me as much as possible in one dose. DrMR: Gotcha. It makes sense, man. Hey, I know you’ve got to run. But thanks for taking the time to jump in on this and talk about brain support. And you seem to do pretty well despite being a little glue high. Is there anywhere you want to point people? A website, book, anything like that? BG: Maybe we discovered a new nootropic: glue! DrMR: Right. The 4-year-old kids were right! BG: Yeah. I would just say, yeah, if you want to link to anything in the show notes, my blog. People could Google Ben Greenfield. And, again, I designed some supplements. And those are on my website, GetKion.com. I try to put out a newsletter every week. Yeah, that’s it. 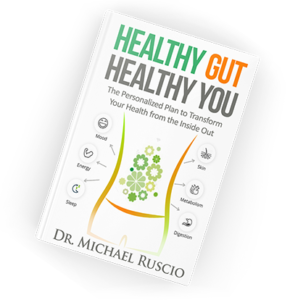 I guess the last thing I would say if folks are listening in—not to brown nose or anything or blow smoke—but if you haven’t read Michael’s book, the Healthy Gut, Healthy You book, I find myself with increasing frequency recommending that book to everyone from the personal trainers I work with who are working with clients to my own clients to just folks who have gut issues. I just tell people, “Yeah, I could tell you all this stuff. But just go buy Michael’s book.” So, yeah, there’s a plug for your book, dude. I do dig it. So thanks for writing that. DrMR: Thanks, brother! I appreciate it. Cool. Well, thank you again, my man. Go fire some arrows off. And hopefully we’ll chat soon. BG: All right, later, dude. Ben Greenfield mentioned trying to minimize blue light from devices and you chatted with him about it. Is there any valid research that supports the ill effects of blue light? Ben references several sources here: https://bengreenfieldfitness.com/article/biohacking-articles/best-lighting-home-office/ Hope this helps! A very good general information you got there. Thank you for sharing your thoughts this will really help us out a lot.